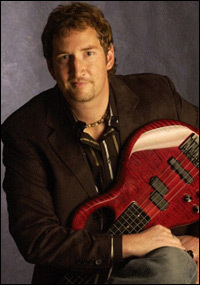 On October 7, bassist Jeff Schmidt of San Rafael, California was declared the winner of the first Bass Extremes International Contemporary Solo Bass Competition. 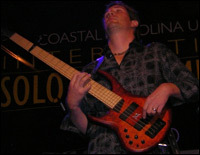 Before a live audience and an all-star panel of judges including bass greats Victor Wooten, Steve Bailey, Anthony Jackson, Will Lee, and drummer Gregg Bissonette, Schmidt performed three compositions for unaccompanied bass guitar at Coastal Carolina University in Myrtle Beach, South Carolina. "If this competition was about who could display the best knowledge and application of music theory, I wouldn't have been there. If it was about who could play the fastest or demonstrate the most mind-boggling technique, I wouldn't have been there, but I possessed something that the judges felt was emotive and musical, and that is what this competition was all about," said Schmidt. Schmidt also stated, "I thought I did exceptionally well considering this was the first time I had ever performed solo bass in front of a live audience." 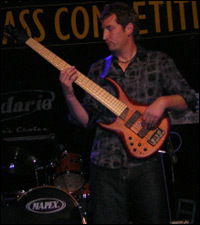 Other finalists included Brazilian bass sensation Zuzo Moussawer and the Charlie Mingus Big Band bassist, Boris Kozlov, who finished in second and third places, respectively. "Everyone played great. The entire experience of the competition process was simply amazing and something I'll never forget," added Schmidt. 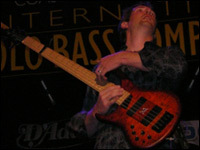 Following his first place finish, Schmidt discusses his unique solo bass competition experience including the sequence of events that led him on his current path, the preparation for the event, what it was like playing solo bass in front of an audience and judges for the first time, and his future as a solo bassist. Can you provide us with some background on how you got involved with music and what led to your pursuit of playing bass? When I was a young child growing up in Albany, New York, there was always music in the house. It wasn't what I'd call great music, but my mother had an appreciation and joy for music which she instilled in me. She played lots of Elvis Presley's, ABBA's, and Tom Jones' music. She also played organ and really exposed me to an appreciation for music. I was particularly struck by a live Elvis album she had because the crowd was going nuts over one guy. It wasn't about a band. Thousands of screaming fans were there just for Elvis. That really captivated me when I was a really small kid. My brother and I, along with a few friends, would always lip-sync to records that were playing, but I really didn't think about playing a specific instrument until the birth of MTV. I saw videos of guys playing guitar, and I simply had to learn how to play that instrument. My parents bought me a little plastic guitar with plastic frets and nylon strings. Soon after, I upgraded to a department store guitar and started playing with some friends. The summer before high school, me and my friends put together our first band. The older brother of one of my friends played guitar better than I did so I had to move to bass in order to be a member of the band. At first, I rejected that because I really wanted to play guitar, but I borrowed a bass and learned a few songs. We started playing rock songs like "Smoke On The Water," "Don't Fear The Reaper," and other classics. I took to the bass really quickly. We were able to play quite a few tunes in high school that other bands couldn't play because their bass player couldn't handle the parts. We progressed into playing tunes like "The Real Me" by the Who which I thought was the greatest bassline I had heard up to that point. Then, we got into Rush, Yes, King Crimson, and the more complicated Grateful Dead songs. We also played quite a few original pieces. Our band really maintained a strong following throughout high school, and we won several competitions. I received so many positive compliments about my playing from adults, and people were telling me how I should keep pursuing the bass seriously. I didn't know anything about theory or the technical requirements of the instrument. I was a complete ear player, and everything I was playing was based upon what I had picked up by learning riffs off of recordings. I tried joining the high school jazz band, but I couldn't read music. That experience really exposed me to what I needed to do in order to become a professional musician. It wasn't just about being able to play Rush songs note-for-note. If I wanted to make a living as a bass player, I had a lot to learn. I made it clear to my parents that I wanted to study music after high school. I wanted to attend Musicians Institute and learn everything I needed to in order to make a living playing music. Then, my girlfriend got pregnant, and that changed everything. We got married and started a family so music had to take a back seat. I ended up selling almost all of my gear and went through a period where I came up with all these little thoughts that seemed to justify not playing bass any longer. I graduated from high school in 1986, and by 1989, I didn't even have a bass any longer. Eventually, me and my wife ended up getting a divorce, and I decided to change careers and get into radio. I'm still in the radio industry today. I do a lot of behind the scenes work including production and on-air marketing. I moved to San Francisco in 1997. One day in 1998, I fell asleep on the couch while watching television, and I woke up around 3 AM to the sounds of bass. There was this guy on television playing three basses simultaneously, and I was completely blown away. I was immediately hit with the thought of what I had been doing with my life. Why wasn't I doing that? The television show that I awoke to was called "The Artist's Profile: Michael Manring." I just caught the last 15 minutes of the program, but it lit a fire inside me. I couldn't believe I had never heard of Michael, but I had been out of touch with the bass scene for so long and hadn't played in over 8 years. I didn't know any of the guys who had made a name for themselves during that period. The last great bassist that I had heard of before I stopped playing in the late 1980's was Jeff Berlin. I had inquired about information on Musicians Institute, and they sent me a package of material. Within that package was a cassette tape of Jeff Berlin, and his playing just floored me. I had never heard anyone approach the instrument like that. The day after catching Michael's performance on television, I picked up a used bass on Ebay. Michael had just released his most recent recording at that time, The Book Of Flame. I thought it was the greatest recording I had ever heard. It was so creative and sounded so fun. I really liked all the unusual tonalities along with the overdubbing and sampling. I had a background in production so I knew I could record material similar to what Michael was doing. I tried to mimic, or I should say steal, a lot of little things he was doing and incorporate it into something of my own. MP3.com was a huge web site around that time, and I had my own web page there. I met a lot of great people through that web site, but I really didn't receive the kind of response I had hoped for regarding my playing from people through MP3.com. I became somewhat discouraged and kind of put the bass down for awhile. I'd pick it up to noodle on from time to time, but I wasn't too serious about it and didn't think I'd ever make anything with music. In 2003, my wife decided to quit her job, go back to school, and start a new career. In the process of watching her go back to the beginning and start all over, that really inspired me. Then, it hit me. I really needed to go back and take music more seriously. In 2004, I got together with a local instructor, and in our first lesson, I told him to treat me like I knew nothing and had never touched the instrument. I had developed a lot of bad habits over the years, and I just wanted him to fix me. The first couple of weeks were pretty brutal. All you'd hear coming from my practice room was just boom, boom, boom. I literally went back to the beginning. I learned how to hold the bass and fret a note. I learned basic alternating finger exercises and all of the other things that beginners should learn how to do. I knew I had to correct all of my bad habits in order to proceed forward with playing bass on a professional level. Even though I hadn't touched the bass in years, I still retained most of the technical facility that I had developed early on, but I didn't know how to use it. I really became frustrated in trying to learn theory and think so analytically about music. Throughout this entire re-learning process I came to realize that sometimes I just need to hear the same idea explained from different points of view. Every time I hear the same idea explained a little differently, I gain a greater understanding of it. I'm constantly trying to listen to different people's perspectives on music and playing bass. Sometimes the smallest things just open up a completely new world for me. Who would you cite as your primary influences? Michael Manring has definitely been a huge influence on my approach. He completely re-awakened the bass player inside of me in 1998 because his style was so fresh and innovative. When I first began playing, I loved Geddy Lee, Chris Squire, and Andy West. Jaco was really big back then, too. I always loved Pat Metheny in a trio setting, and in 1986, I was really into Song X with Ornette Coleman. That was one of my favorite recordings. There was something so raw and fascinating about his playing. Later on, I discovered Miles Davis. During the period from about 1956-1967, he released some of his best material, and his bands were amazing. Of course, I'm influenced by all the great contemporary bass players to a certain degree. For example, I just attended BassQuake a couple weeks ago and met 6-string bassist, Todd Johnson. He's not a huge name yet, but I was so happy to get the opportunity to see a guy like that play because he's so incredible at what he does. Can you tell us about your particular playing style? I play bass left-handed, upside down like Jimmy Haslip. One of the reasons I don't do a lot of flashy techniques is because most of the techniques that right-handed bassists use are physically impossible to do on a bass that is strung upside down, C-G-D-A-E. Slap bass is difficult to execute on my basses due to how they are tuned. Generally, right-handed bassists slap a low-sounding string with their thumb and pluck a higher-sounding string with their index finger, but it's just backwards for me. I can still produce slapped tones on my basses, but I could never play Marcus Miller or Victor Wooten lines. It would be physically impossible due to the arrangement of the strings. I do like to experiment with altered tunings. In fact, all of the pieces I played for the solo bass competition were in different altered tunings. For example, I performed "Little Sunflower" on my primary fretted bass, an MTD 535, which was tuned A-B-F#-B-E (lowest-sounding string to high), and I placed a capo across the strings at the third fret. To perform my arrangement of "Yardbird Suite," I simply removed the capo from the MTD and played it in the same tuning. I played "Until You Don't (You Need It)" on my Pedulla PentaBuzz fretless 5-string which was tuned Ab-C-Eb-C-Eb. Is music a full-time profession for you? I'm definitely not a professional, full-time bassist. I continue to work a day job. Until just a few months ago before this competition, I wasn't sure if I wanted to pursue solo bass music or if I should play within some kind of ensemble setting. I've taken part in various jam sessions over the years, but the experience always left me unfulfilled. Jam sessions were fun, but they were really nothing more than distractions. It wasn't all that serious. This solo bass competition came along, and I thought it was a great opportunity to try out some of my ideas. The solo bass competition gave me direction, and now I have a better idea on what I want to do. How would you summarize your overall experience with the competition? It was amazing. This was the first time I had ever played solo bass music in front of an audience before, and not having played in front of an audience in a really long time, there was definitely a confidence issue there. I had never arranged a song for solo bass before this competition. In fact, when I was reading through the requirements in order to enter this contest, I noticed that you had to do an arrangement of a classic standard, and my heart just sank because I had never done that before. However, when I arrived at the competition, I felt immediately comfortable. My playing had already been judged to a certain extent because I was invited to perform so the judges felt like I belonged there. If they didn't feel my playing was good enough, I wouldn't have been there. I was the last performer to take the stage which I was hoping wouldn't happen because compared to every other finalist, my material was significantly slower and contained far fewer notes. I knew I didn't have the pyrotechnic bass chops the other finalists used. I was a little nervous when I first came out, and that impacted the performance of my first piece. The overall feeling wasn't as shocking or as heavy as I had initially anticipated playing solo bass in front of a live audience, especially with all of the judges sitting right there watching every move. I'm really glad I didn't feel all that pressure because if I had, my mistakes, which were many, would have really thrown me off my game. When I was practicing my pieces in the weeks preceding the live competition, I knew I wouldn't be able to play every piece perfectly so I practiced playing through mistakes, not allowing me to lose focus with the task at hand or ruin the performance. The live show was an absolute blast. What kind of material did you record to demonstrate your skills for the initial audition? During the preliminary round, the rules stated that you had to submit two pieces. One track could be an original composition or a cover tune of your choosing. For the other track, you had to pick a tune from a list of repertoire songs and arrange it in any fashion that you'd like. Those songs included "Stella By Starlight," "My Funny Valentine," "Little Sunflower," and "Michelle." You could only use one bass. Looping and overdubs were not permitted. You could, however, use drums or percussion on one of the tracks, but I decided not to do that. I had a difficult time deciding which tune to arrange from the repertoire pieces. I figured that "Stella" would be the most popular song and submitted the most by other contestants. I wanted a song that had a lot of room in it so that I could put me into it and build my playing around the melody. "Stella" just had too many chord changes. I'm sure many of the other contestants did some amazing things with "Stella," but it just wasn't the right vehicle for me to display my voice. I ended up choosing "Little Sunflower" because it's a very open piece of music, and I felt like there were so many different possibilities I could explore within it. Actually, I came up with so many possibilities for that piece that I became overwhelmed with them all and ended up spending a week just narrowing down my options. Coming up with a million ideas was easy, but the really difficult task was editing those possibilities down to the end result. For the second piece, I was definitely going to play an original, but I had a hard time deciding if I wanted to do something fast and flashy or something slow and melodic. I knew some of the flashiest bassists on the planet would be among the finalists, but I decided to go against what my instincts were telling me to do in order to hang with the other finalists. I ended up playing a slow fretless piece that I titled "Until You Don't (You Need It)." About a month after I submitted my materials, I received a voice mail from Steve Bailey just verifying that I was only playing one bass on that piece. As I had mentioned earlier, I play it in an altered tuning so it does sound a little deceptive in places. I e-mailed Steve back with an outline of the composition. Then, he called me back about a week later and asked me to play the piece live in the finals. After I recorded my two pieces and submitted them, I didn't touch either one of them for over a month because I was so burned out from preparing them. Did you perform those same pieces live in the final round? Yes. I did perform both "Little Sunflower" and "Until You Don't (You Need It)" live along with a blues arrangement. Six days before the live competition, they contacted all the finalists and told us that we would be required to play a solo arrangement of a blues tune of our choosing so I put together a bluesy arrangement of "Yardbird Suite" by Charlie Parker. I was just starting to feel comfortable with the tunes I had submitted, and then they throw the blues tune at us six days before the event. I kind of panicked, but I picked a blues-based tune and put it together in about a day. As I was searching for a blues tune to arrange, the melody of "Yardbird Suite" kept popping into my head so I went with it. My arrangement wasn't all that complicated, but it was good enough to get the job done. I felt the original versions of the tunes I submitted were fairly conservative so I re-examined "Little Sunflower" and added a little more flare with an extended solo section in the middle along with a tapping/slapping section at the end to make the piece more dramatic-sounding. It worked great live because the audience really got into it, but I probably wouldn't record this piece in that fashion for a recording that I'd release. My goal with the fretless piece was to keep it as simple as possible. Michael Manring gave me some great advice at the BassQuake event a couple weeks ago. I asked him what he'd recommend doing in order to stay in control of the music without rushing when playing it live in front of an audience when your adrenalin is pumping. He told me to practice the material at half the performance tempo. I followed his advice, and it worked out great. I ended up playing the pieces slower live than their original recorded versions, and I thought they sounded better at the slower tempo because there was more space. His advice helped me overcome the mental anxiety of performing solo in front of a live audience for the first time. It helped me relax more and focus. What were the criteria used in judging your performance? The competition did have criteria listed on its web site such as use of dynamics, control of tone and intonation, harmonic interest, and overall performance, among other things. However, I never really looked at that list and told myself to focus on any particular aspect. After we all finished our sets, we were called back to the stage where we sat in front of the judges, and they all critiqued us. Each one of the judges outlined the pluses and minuses of our performance. I thought this part of the process was really fascinating. To me, that alone was worth the price of admission. It wasn't as formal as many other competitions are, and I think that definitely benefited me. If it had been like the Olympics where you are going to do a move and everyone knows what you are going to do before you do it and then the judges give you a specific score depending on how well you executed that move, I probably wouldn't have won. Obviously, judging music is very subjective. There were probably things that deducted from our scores, and I'm sure there were things that added to our scores, but I'm not exactly sure what those things were because the judges never revealed the checklist of how they added things up. There were obvious mistakes that I made, and there were obvious mistakes that the other finalists made, but I'm not sure what was specifically deducted from our scores. During the onstage critique, I was fascinated in comparing what I picked up on while the other finalists were playing with what the judges noticed because they caught things that I completely missed. Each of the judges took notes during the performances, and then during intermission, they all came to some kind of consensus. I wouldn't have wanted to be a judge for that competition. Everyone was so great. When we arrived, they told us right away that all of the five bassists who received honorable mentions were at some point at the top of at least one of the judge's lists. Any of the nine top bassists could have been picked to be in the finals. The level of distinction amongst us was so small. How can you pick a winner? How do you feel you matched up against the other finalists? I've always had a really difficult time judging other bassists and analyzing my playing against their skills because I seem to have a tendency to think that everyone is always better than me. We all know what we can't do, and when I watch other players perform, I can see what they are doing that I can't do. When I'm watching other bassists, I'm not thinking that I could do something necessarily better than what they are doing, but I'm looking at the things that person is doing that I can't do. That keeps me humble. There are so many great players today, and there is always going to be someone somewhere doing things better than you. I don't think there is anything that I play that the other finalists couldn't play themselves. I went into the competition knowing that if it was going to be a chopsfest, I wasn't going to win so I didn't even want to take that route. All of the finalists came from completely different backgrounds. Zuzo's performances showcased his really innovative techniques. He was coming from a very percussive background. He tapped and slapped "Donna Lee" in a samba style. Boris was definitely the jazz guy, and you could tell that he was really saturated in that environment because he had a total command over some really advanced material. If this competition was about who could display the best knowledge and application of music theory, I wouldn't have been there. If it was about who could play the fastest or demonstrate the most mind-boggling technique, I wouldn't have been there. Honestly, when I submitted my entry, I didn't think it was going to be flashy or fast enough, but all I really wanted to receive out of it was a critique of my playing. If you entered the competition and submitted a recording, they promised to critique it. I thought that alone was worth the price of the entry fee. I really thought having Steve Bailey or Victor Wooten or one of the other judges write a few sentences about my playing and send it to me was well worth my time and money. That was my whole motivation. On the solo bass competition web site, they really placed the emphasis on the competition not about being able to double thump 32nd notes or tap but rather about the playing being very musical. If you had something musical to say, send it in. That really clinched it for me. In the end, it was about emotion and playing music on bass. Besides winning the competition, did you have any particular goals you wanted to achieve? I just wanted to enjoy every second of it no matter what happened, and the event organizers as well as the judges made it so easy to do that. I was kind of ignorant about the whole process going into it because I didn't know what to expect. Even if I hadn't been asked to perform, just the process of getting an entry together and meeting the deadline was a big deal to me and an amazing learning experience. Prior to this, I never really had a reason to finish anything musically so I didn't. My main goal was to meet the application deadline, and I learned so much over the course of the past few months. How did you feel about the live performance of your music? I thought it went very well. Even though I had made some mistakes, I still felt great about the overall performance of my pieces. I was the last of the finalists to take the stage so there was a bit of an intimidation factor involved. Zuzo performed right before me, and he was the flashiest player there. After the performances when the judges were critiquing us, Victor mentioned that I seemed a little nervous during the performance of my first piece, but I pulled through it. Steve pointed out that I missed a few harmonics during my first song, but he didn't think it slowed me down any. I knew I wasn't going to sneak any kind of mistake past any of the judges, and I have to credit meditation for my ability to rebound so quickly. When I walked onto the stage, my mind was very clear. I was very aware of my surroundings and what was going on, but I wasn't being bothered by a lot of mental chatter. As I played, I can recall how I caught myself making mistakes but continued to play right through them. There are two kinds of mistakes you can make. There is the kind of mistake that you know was wrong, but no one else notices. Then, there is the kind of mistake that everyone knows you made. There was a harmonic in the first piece that I missed which was really obvious. Instead of going "ting," I missed the harmonic, and it went "thunk." At that point, a little voice inside me went ok, that should be good enough for last place. It only lasted for a split second though, and it didn't weigh me down. Being prepared mentally was really a key aspect for me because things could have really went bad and fallen apart after that occurred. What were your thoughts when they announced you had won? It was a surreal moment. I don't even remember them calling my name. I kind of blanked out for a second. The crowd roared, flash bulbs starting going off, and then they handed me a plate that said first prize on it. There was definitely a certain level of disbelief in that I had won. Right after they announced I had won, we had to quickly rush off the stage to get our basses for an all-star jam. It all happened so quickly that I didn't really have time to think about it. Then, we all performed with all of the judges. Gregg took his place behind the drums. Will Lee laid down a groove. Victor, Steve, and everyone else followed, jamming over this groove for about ten minutes. Afterwards, there was a V.I.P. reception, and I was just astounded by how many people wanted to talk to me and get my autograph. It was such an amazing experience. What did you receive as the winner of the competition? I received a bunch of really cool gear including amps, basses, a year's supply of strings, and some cash as well. I will also be involved in some kind of Bass Extremes project in the future, too. Steve had mentioned that they weren't sure when the next project was going to happen, but they were going to keep me up to date on it. What advice would you suggest to bassists interested in taking part in this competition in the future? Do it! Don't be intimidated by the whole process. By all objective standards, I should have never been in this contest. If you are looking at educational level, experience level, or the ability to play in a flashy fashion, there is no one that would have said that I belonged in this contest. However, I did have something musical to say, and I think that is what they were trying to emphasize. You have to keep in mind that this was a solo bass contest, not a bass solo contest. There is a distinction. This contest was clearly not about being the best bass player in the world. If you have a musical idea and want to play bass as a legitimate solo instrument, get your material recorded and go for it. Receiving the critique alone would have been more than worth the time and effort to me. If I could do this, anyone can do it. Now that you've won the 1st International Solo Bass Competition, what does the future hold? That's a good question. I'm still trying to figure that out. I'm not sure what opportunities this will all lead to for me. It will definitely help in name recognition, and hopefully some doors will open that I couldn't get through on my own just from playing "Little Sunflower" in small clubs around town. Hopefully this will make getting gigs easier and also playing with interesting people. I would definitely like to release a solo project in the future. It might not be a full-length, 15-song recording, but I'd like to put something together. It will probably feature a combination of playing both solo and ensemble material because there is nothing that says I have to do just solo bass forever. I'm really open to whatever lies ahead.